Hariharan Swaminathan received his B.Sc. (Hon.) in mathematics from Dalhousie University, Halifax, Canada, and M.Sc. (Mathematics), and M.Ed. and Ph.D. from the University of Toronto, Canada specializing in psychometrics, statistics, and educational measurement/evaluation. He is currently professor of Education in the Neag School of Education at the University of Connecticut, and serves as the chair of the Department of Educational Psychology. He has served as Professor, associate Dean and Acting Dean in the School of Education at the University of Massachusetts, professor at the University of Miami, and as Principal Research Scientist at Educational testing Service. Professor Swaminathan is internationally recognized for his expertise in educational measurement, and in particular, in the area of item response theory. He has been invited to conduct workshops and deliver papers in the areas of item response theory in such countries as The Netherlands, Spain, Russia, the Republic of Georgia, Australia, Malaysia, Singapore, Egypt, and Indonesia. In addition, he has served as a consultant to numerous testing agencies, state departments of Education, and the Ministries of Education of the Republic of Georgia, Malaysia, Indonesia, Russia, and Egypt. Professor Swaminathan’s research interests are in the areas of Bayesian statistics, psychometrics, item response theory and multivariate analysis including matrix calculus, time series analysis, structural equation modeling, and hierarchical models. He has numerous papers, chapters, technical reports, and conference presentations to his credit; his papers have appeared in such journals as Psychometrika, Multivariate Behavioral research, Applied Psychological Measurement, Journal of Educational Measurement, Educational and Psychological Measurement, and Journal Educational and Behavioral Statistics. He is the coauthor of two books (with Hambleton and Rogers) on item response theory. He has served on the editorial boards of Journal of Educational Measurement, Applied Psychological Measurement, Educational and Psychological Measurement, Journal of Educational and Behavioral Statistics; he has served as a member of the Graduate Records Examination Board, the Technical Advisory Committee for Law Schools Admission Council, National Board for Professional Teaching Standards, the Design and Analysis committee of the National Assessment of Educational Progress, and on the Board of Directors of the National Council for Measurement in Education. Professor Swaminathan teaches and has taught graduate level courses in the areas of multivariate statistics, item response theory, structural equation modeling, advanced psychometrics, and Bayesian statistics. In addition to teaching graduate level courses in the area of psychometrics and measurement, Dr. Swaminathan has conducted numerous training workshops on Item Response Theory nationally and internationally for educational institutions and agencies as the American Educational Research Association, the National Council for Measurement in Education, the Law School Admission Council, University of Oviedo in Spain, the Egyptian Ministry of Culture and Children’s Affair, the Malaysian Examination Syndicate, the Examination Center in Indonesia, the University of Western Australia in Perth, the Republic of Georgia, and Russia. He was invited to be the keynote speaker at the Annual Psychometric Conference at the University of Twente in the Netherlands, and as a speaker in the Presidential Lecture series for the National Board of Medical Examiners. Professor Swaminathan has served on numerous technical advisory panels and boards such as the Graduate Records Examinations (GRE) Board, member of the Design and Analysis Committee of ETS and NCES, the Measurement Research Advisory Panel for the National Board of Professional Teaching Standards, and the Law School Admissions Council Technical Advisory Panel. In addition he has served as a consultant to the National Board of Medical Examiners, the Board of Internal Medicine, the Canadian Nursing Association, the Canadian Medical Association, National Evaluation Systems, the Florida Supreme Court (which commissioned him to carry out a major study examining the impact of the Florida Bar Examination on minority candidates), the US Naval Personnel Research and Development Center, the US Air Force, the US Army, the Malaysian Ministry of Education, the Malaysian Institute for Administration and Management, the Civil Service Commission of Sarawak, and the Indonesian Ministry of Culture and Education. More recently, Professor Swaminathan has worked with the Ministry of Education in the republic of Georgia in developing the Georgian National Assessment System. He is currently working with the Connecticut State Department of Education in developing the State’s student growth assessment system. Professor Swaminathan has received numerous awards for his contributions. He has received the Outstanding Teacher award from the University of Massachusetts School of Education and the Jacob Cohen Award for Distinguished Teaching and Mentoring from the American Psychological Association. He has served as the President of Educational Statisticians, a special interest group of the American Educational research Association, and was elected to the Board of Directors of the National Council for Measurement in education. He received the Governor’s award for outstanding contribution to the State of Connecticut by a naturalized citizen for his work with the State department of Education. 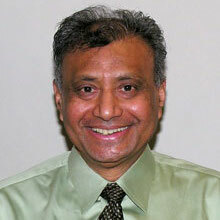 Professor Swaminathan was elected Fellow of the American Educational research Association in 2010. Algina, J.. & Swaminathan, H. (in press). Psychometrics: Classical test theory. In Wright, J.D. (ed). The International Encyclopedia of Social and Behavioral Sciences. London: Elsevier Publishing Co.
Rogers, H. J., & Swaminathan, H. (in press). Differential Item Functioning: Past, Present, and Future. In C. Wells & M. Faulkner-Bond (Eds. ), Educational Measurement: From Foundations to Future. Guilford Press. Swaminathan, H., & Rogers, H.J. (in press). Normal ogive multidimensional models. In W. van der Linden & Hambleton, R.H. Handbook of Modern item response Theory, Volume 1. New York: Taylor and Francis. Swaminathan, H., Rogers H. J., Horner, R.A. (2014). An effect size measure and Bayesian analysis of single case designs. Journal of School Psychology, 52(2), 213-230. Swaminathan, H., Rogers, H.J., Horner, R.H., Sugai, G., & Smolkowski, K. (2014): Regression models and effect size measures for single case designs. Neuropsychological Rehabilitation: An International Journal. DOI: 10.1080/09602011.2014.887586. Briesch, A., Swaminathan, H., Welsh, M., Chafouleas, S. (2014): A guide to generalizability theory: Understanding current practice and facilitating use in assessment. Journal of School Psychology, 52(1):13-35. doi: 10.1016/j.jsp.2013.11.008. Hattie, J., Rogers, H. J., & Swaminathan, H. (2014). The role of meta-analysis in educational research. In A. Reid, P. Hart, M. Peters, & C. Russell (Eds), A Companion to Research in Education, Dordrecht: Springer. Horner, R., Swaminathan, H., Sugai, G., & Smolkowski, K. (2012). Expanding analysis and use of single-case research. Education and Treatment of Children, 35, 269-290. Maggin, D.; Swaminathan, H.; Rogers, H.J. ; O’Keefe, B; Sugai, G.; Horner, R. (2011). A Generalized Least Squares Regression Approach for Computing Effect Sizes in Single-Case Research: Application Examples. Journal of School Psychology, 49, 301-321. Algina, J.. & Swaminathan, H. (2010). Centering in multilevel models. In J. Hox & K. Roberts (Eds).Handbook of Advanced Multilevel Data Analysis. New York: Routledge. Swaminathan, H., Rogers, H. J., & Sen, R. (2010). Research methodology for decision-making in school psychology. In T. Kehle & M. Bray (Eds. ), Oxford handbook of school psychology. New York: Oxford University Press. Swaminathan, H. & Rogers, H.J. (2008). Estimation in multilevel models. In A.O’Connell and B. McCoach (eds). Multilevel Analysis of Educational Data. Swaminathan, H. (2007). Bayesian estimation in item response theory. Encyclopedia of Behavioral Sciences. New York: Wiley. Swaminathan, H. &Hambleton, R.K.& Rogers, H.J. (2007) Assessing fit in item response models. In C.R. Rao and S. Sinharay (eds). Handbook of Statistics: Psychometrics. London: Elsevier Publishing Co.
Swaminathan, H. & Rogers, H.J. (2007) Statistical reform in school psychology research: A synthesis. Psychology in the Schools, 44(5), pp. 543-549. Swaminathan, H., Hambleton, R.K., Sireci, S., Xing, D., Rizavi, S. (2003) Bayesian estimation of item parameters in small samples. Applied Psychological Measurement, 27(1) 27-51. Keller, L, Swaminathan, H., Sireci, S. (2003) Evaluating scoring procedures for context dependent item sets. Applied Measurement in Education, 16(3) 207-221. Swaminathan, H. (1998) Bayesian estimation in item response models. Proceedings of the American Statistical Association, 8-15. Narayanan, P. & Swaminathan, H. (1994). Performance of the Mantel-Haenszel and simultaneous item bias procedures for detecting differential item functioning. Applied Psychological Measurement, 18, 315-328. Rogers, H. J., & Swaminathan, H. (1993). Comparison of the logistic regression and Mantel-Haenszel procedures for detecting differential item functioning. Applied Psychological Measurement. Swaminathan, H. (1991). Covariance structure analysis with applications to test validity. In R.K. Hambleton & J. Zaal (Eds. ), Advances in Educational and Psychological Testing. Boston, MA: Kluwer-Nijhoff Publishing Company. Swaminathan, H., & Rogers, H. J. (1990). Detecting differential item functioning using logistic regression procedures. Journal of Educational Measurement, 27(4), 361-369. Gifford, J.A. & Swaminathan, H. (1990). Accuracy, bias, and effect of priors on the Bayesian estimators of parameters in item response models. Applied Psychological Measurement, 14(1), 33-43. Swaminathan, H. (1989). Interpreting the results of multivariate analysis of variance. In B. Thompson (Ed. ), Advances in social science methodology, pp. 205-232. Greenwich, Conn.: JAI Press. Swaminathan, H. (1989). Multilevel data analysis. In R.D. Bock (Ed. ), Multilevel analysis of educational data. New York: Academic Press. Swaminathan, H., & Gifford, J. A. (1986). Bayesian estimation in the three-parameter logistic model. Psychometrika, 51, 589-601. Swaminathan, H., & Gifford, J. A. (1985). Bayesian estimation in the two-parameter logistic model. Psychometrika, 50, 349-364. Swaminathan, H. (1985). Longitudinal factor analysis. In H. C. Lau, C. W. Snyder, Jr., J. Hattie, & R. P. McDonald (Eds. ), Research Methods for multi-mode data analysis. London: Praeger. Swaminathan, H., & Gifford, J. A. (1982). Bayesian estimation in the Rasch model. Journal of Educational Statistics, 7, 175-192. Swaminathan, H., & DeFriesse, R. (1979). Detecting significant contrasts in analysis of variance. Educational and Psychological Measurement, 39, 39-44. Algina, J., & Swaminathan, H. (1979). Alternative procedures for the analysis of time-series designs. Psychological Bulletin, 86, 919-926. Swaminathan, H., & Algina, J. (1978). Scale-freeness in factor analysis. Psychometrika, 43, 581-583. Swaminathan, H., & Algina, J. (1977). Analysis of quasi-experimental time-series designs. Journal of Multivariate Behavioral Research, 12, 111-131. Swaminathan, H. (1976). Matrix calculus for functions of partitioned matrices. General Systems, 21, 95-99. Swaminathan, H., Hambleton, R. K., & Algina, J. (1975). A Bayesian decision- theoretic procedure for use with criterion-referenced tests. Journal of Educational Measurement, 12, 87-98. Swaminathan, H., Hambleton, R. K., & Algina, J. (1974). Reliability of criterion- referenced tests: A decision theoretic approach. Journal of Educational Measurement, 11, 263-267. McDonald, R. P., & Swaminathan, H. (1973). A simplified matrix calculus with applications to multivariate analysis. General Systems, 18, 37-53.
keynote Speaker, The Third Black Sea Conference, Georgia, 2014. Governor’s Award for Distinguished Service to Connecticut by a Naturalized Citizen, 2009. Jacob Cohen Distinguished Award Teaching and Mentoring, American Psychological Association, 2008. Member, Board of Directors, National Council for Measurement in Education, 2005-2008. Presidential Award Speaker, National Board of Medical Examiners, Philadelphia, May 2000. Keynote speaker, University of Twente, Twente, The Netherlands, 1989. Member, Technical Advisory Group, National Board for Professional Teaching Standards. 1997 – 2002. Member, NAEP Design and Analysis Committee, 1995 – 2002. Member, Technical Peer Review Committee, Law School Admissions Council, 1991.